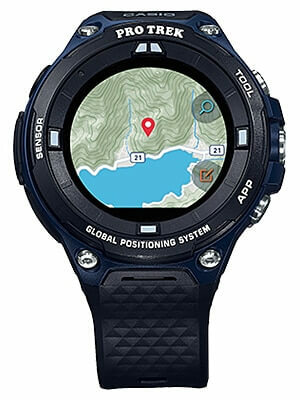 Casio is releasing another Pro Trek WSD-F20 Smart Outdoor Watch model in the WSD-F20A, featuring an indigo blue body color that matches jeans and outdoorwear. The WSD-F20A is designed for outdoor enthusiasts with features like built-in GPS and offline maps that offer navigation features without the need for cellular service. Other built-in features include an altimeter, barometer, compass, and activity tracker. The WSD-F20A has MIL-STD-810-compliant durability, 50-meter water resistance, and a battery-efficient dual-layer LCD with a monochrome time-mode layer. The 1.32-inch color touchscreen is powered by Google’s Wear OS. The WSD-F20A-BU will be released in the U.S. in May 2018 with a list price of $399 USD. This is considerably less than the $500 list price of the original WSD-F20 models. While the internal technical specs are the same compared to the WSD-F20, to account for the cheaper price the WSD-F20A has a resin buckle rather than stainless steel and does not have a textured grip on the side buttons. If you ask us that’s not a bad downgrade for such a significant price reduction. Casio also added more apps to its “Featured Apps” list which is available for all WSD-F20 models. These apps include ViewRanger (trekking), Hole19 (golf), Glassy Surf Report, Ski Tracks, MySwimPro Swimming Workout Log, Fishbrain (fishing forecast and fishing spot display), Zombies, Run! (fitness gaming), Equilab (horse riding), and Exercise Timer. Update: The WSD-F20A is now available on Amazon. Amazon also added a second WSD-F20A listing.